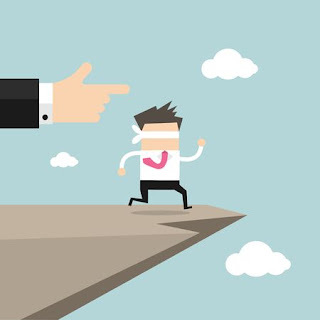 When leaders fail to lead. Three years ago a controversial bylaws change was suggested for the American Occupational Therapy Association that granted the Board of Directors powers to revoke memberships based on complaint of other members and a finding of 'cause.' This issue was fully discussed and documented in this blog at the time of the release of the proposal. 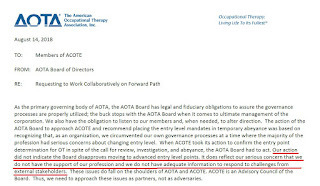 How a motion to affirm dual levels of entry for occupational therapy was killed by the leaders of the AOTA. It is important for the occupational therapy profession to understand that there was close collaboration between the RA leadership and the AOTA Board of Directors leading up to the Fall meeting. As such, the Board of Directors may have been able to shape and form the agenda and the response to motions long before they ever were formally discussed by the RA members. The reason why Motion One on dual entry was killed was by what appears to be coordinated table setting engaged in by the AOTA Board of Directors, facilitated by the RA Leadership team, and then followed by those RA members who bothered to participate. 8/14/18: AOTA signals to ACOTE that it still supports the doctoral single point of entry but just lacks the evidence to support the decision. 8/23/18: AOTA member contacts RA rep about dual entry motion.